Retirement 2.0: Antal Szerb. Journey by Moonlight. When I was in High School my favourite pasttime was walking. Or rather, loitering. If we are talking about my adolescence, it's the more accurate word. Systematically, one by one, I explored all the districts of Pest. I relished the special atmosphere of every quarter and every street. Even now I can still find the same delight in houses that I did then. In this respect I've never grown up. Houses have so much to say to me. For me, they are what Nature used to be to the poets--or rather, what the poets thought of as Nature. Antal Szerb. Journey by Moonlight. Journey by Moonlight is the last, and oldest, of four great Hungarian novels I read in Budapest. Antal Szerb (1901-1945--those horrible dates) was one of the greatest literary scholars and novelists of his generation. His work on world literature--including Stephan George, William Blake, and Henrik Ibsen--is still considered authoritative. He was also a translator and professor and one of the most important Hungarian novelists of the twentieth century. 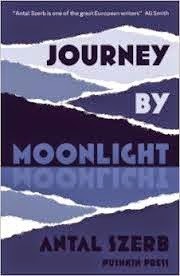 Journey by Moonlight, his most famous novel, was published in 1937. In 1944, Szerb was deported to a concentration camp and beaten to death in 1945, at the age of 43. Journey by Moonlight is the story of a young man, Mihaley, who is on his honeymoon in Italy. One night he unexpectedly meets a man from his youth, and then tells Erzsi, his new wife, the story of his relation with this man, another man, and a brother and sister during his school years and early adulthood. Later, he "accidentally" gets on the wrong train while in Italy and becomes separated from his wife. He then wanders through Italy, meeting other people from his past, until he arrives in Rome. His Italian journey (like that of so many others) is to some hoped for self understanding. It is a journey by moonlight--outside of the world of "the fathers, the Zoltans, the business, world, people." Except that it is not. He ends by going home. The book exhibits what its translator, Len Rix, calls "an irony distinctively Middle-European in character." Journey by Moonlight is the novel all Hungarians "read as students. Every educated Hungarian knowls and loves this book." One can see why: intelligence, humor, warmth, wry acceptance, and of course irony. It is so very Hungarian.